Thwaits Lancaster Bomber Ale is a popular Ale available from DrinkSupermarket.com in 50cl to buy online. Visit DrinkSupermarket.com for the best price for 50cl of Thwaits Lancaster Bomber Ale or compare prices on our other Ale products. Named after the famous second world war aircraft, this ale red-brown in appearance, on the nose the ale has touches of caramel and digestive biscuit. Nice long lasting bitterness with sour earthy aftertaste when consumed leads to wanting to have another sip. 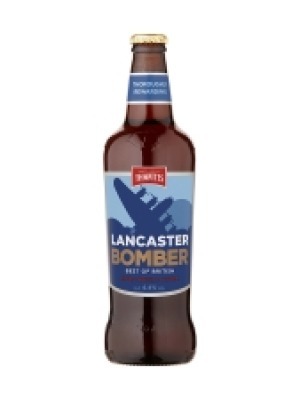 Where to buy Thwaits Lancaster Bomber Ale ? Thwaits Lancaster Bomber Ale Supermarkets & Stockists. You can buy Thwaits Lancaster Bomber Ale online in most retailers and find it in the Ale aisle in supermarkets but we found the best deals online for Thwaits Lancaster Bomber Ale in DrinkSupermarket.com, and others. Compare the current price of Thwaits Lancaster Bomber Ale in 50cl size in the table of offers below. Simply click on the button to order Thwaits Lancaster Bomber Ale online now.